I bought the Tartine Bread cookbook. I had been eyeing it for months. Every time I saw it in a store, I’d pick it up, run my hand over the slightly puffy and spot varnished cover, flip through a few pages, sigh, and put it back. If I bought every hard cover, photo-filled cookbook that I wanted, I’d have to build a house out of them because I wouldn’t be able to pay my rent. But I broke down. First, I grew my own sourdough starter that is still alive (and I suspect drinking all my wine when I leave the apartment). Then I made a travesty of a loaf of bread with said starter. Yet, from the same starter, I managed my favorite pizza dough to date. Following these escapades, I made some bread Jim Lahey style, using purchased yeast and a slow rise, and it was very successful. But I wanted to get back to my starter. 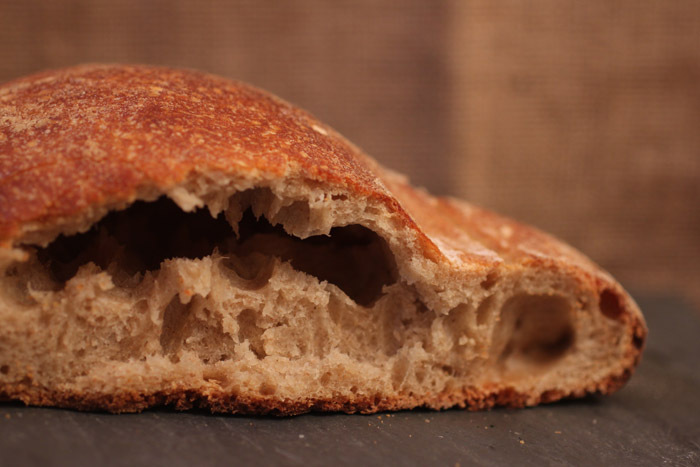 Tartine waxes poetic about cultivating yeast, starters, levains, leavens, etc. The book made me feel that by cultivating my own starter I would be in touch with the tides of the ocean or phases of the moon. REAL old school. Like before they had schools. This is the bread I wanted to make. So I kicked my starter back to life, bought a turquoise kitchen scale, pastry scrapper, and clear container (for dough rising), and was very excited this weekend to put it all together. Getting excited about stuff like this makes people question my sanity. 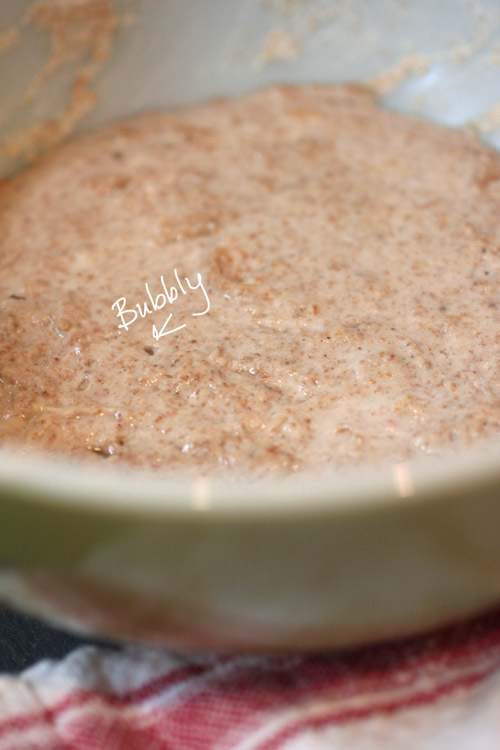 Cover this with a kitchen towel and let it hang out over night to froth and bubble to its yeasty hearts content. * Note: I performed this task after returning from The Mulberry Project and imbibing some very creative gin-based beverages…review forthcoming. 1. 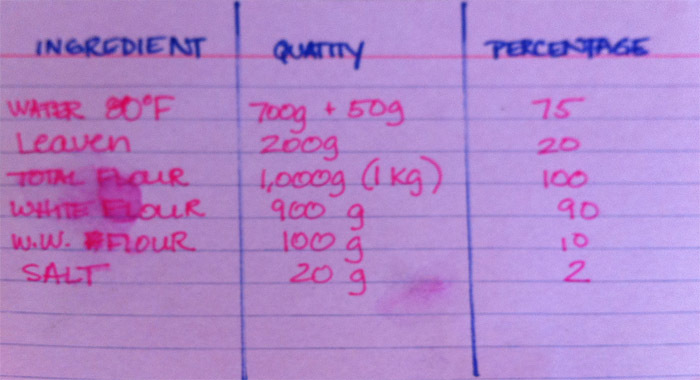 Pour the 700g water into a large mixing bowl and add 200g of leaven. Stir it up! 2. 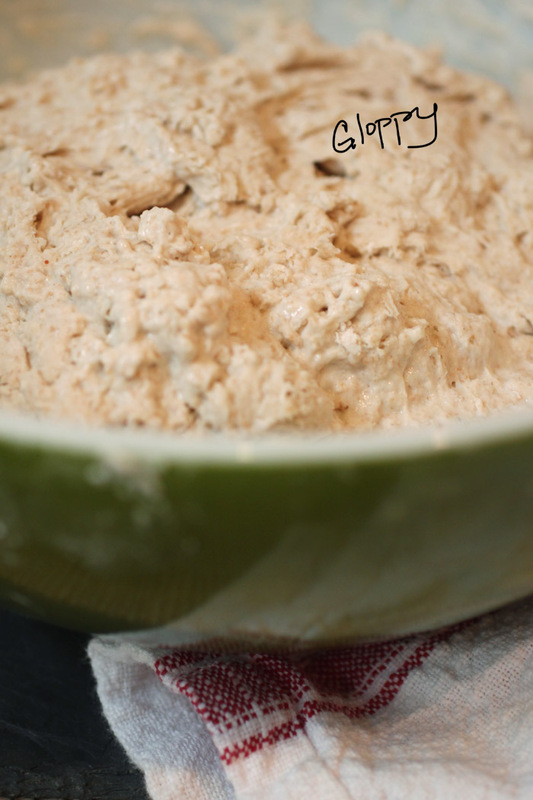 Add the 900g of white flour and 100g of whole wheat flour and mix well. 3. Now let the dough have a nap for 25-40 minutes. DON’T skip the dough nap. Have one yourself. After the dough nap, add the 20g salt and 50g water. Mix the dough by squeeeeeeezing it with your hands and folding it on top of itself. 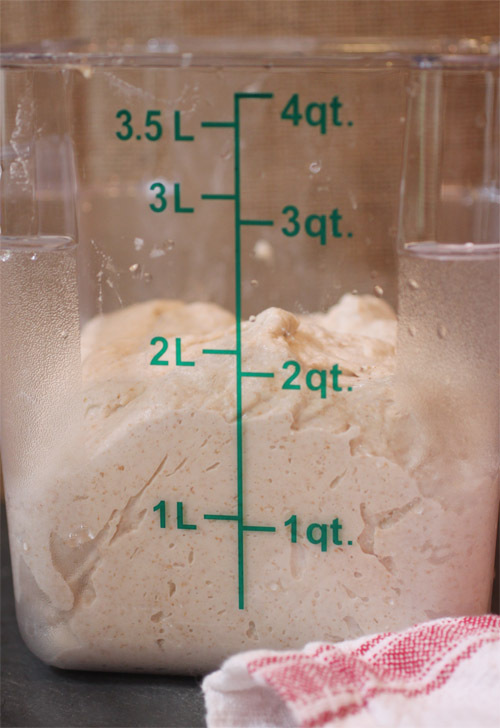 Transfer the squeezed and salted dough to a clear container for the (read with echo): BULK FERMENTATION RISE at 78-82 degrees for about 3-4 hours. 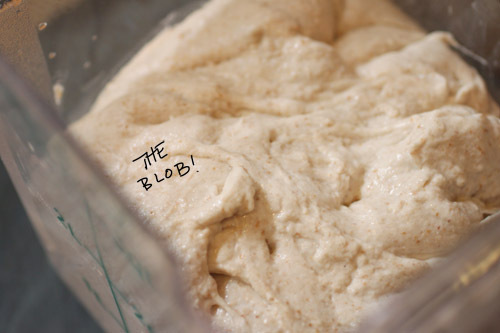 It was during this Bulk Fermentation that I realized my dough wasn’t rising quickly enough. 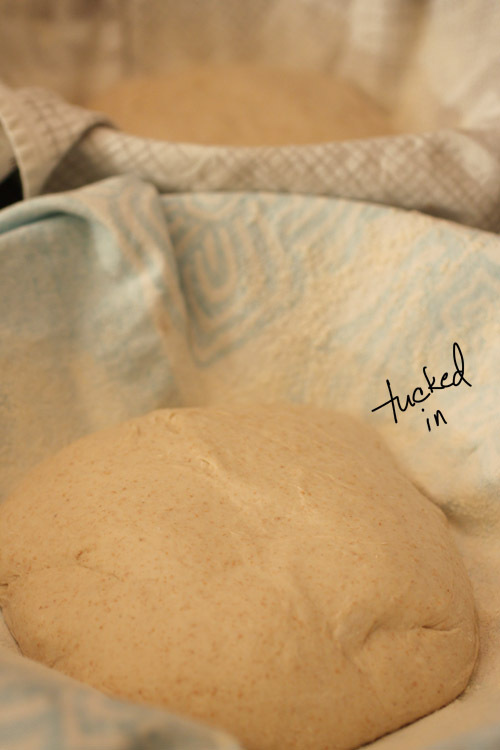 You can extend the rise for as long as necessary, and dough will rise more slowly in colder temperatures. I suspected that my cold and drafty apartment was the reason for the slow rise. Being on the first floor, I have the distinct pleasure of heating the apartments above me in the winter time. This causes me to jack up the thermostat and receive love notes from our local gas/electric provider, PSE&G. I reasoned that if I moved the dough to a warmer, less drafty spot, it would rise faster. So I put it in the warmest room in my apartment: the bathroom. Now, don’t freak out: I haven’t fed anyone other than myself this bathroom bread. And it just sat on the sink counter, not on the toilet or anything. And it was in a container. 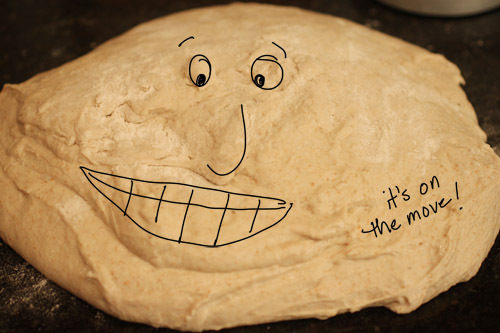 I needed to protect the dough, people! Anyway, after this Bulk Fermentation is finished (keep in mind I wasn’t sure if mine had risen appropriately), remove it from the container (a plastic pastry scraper helps with this), and divide the dough in half. 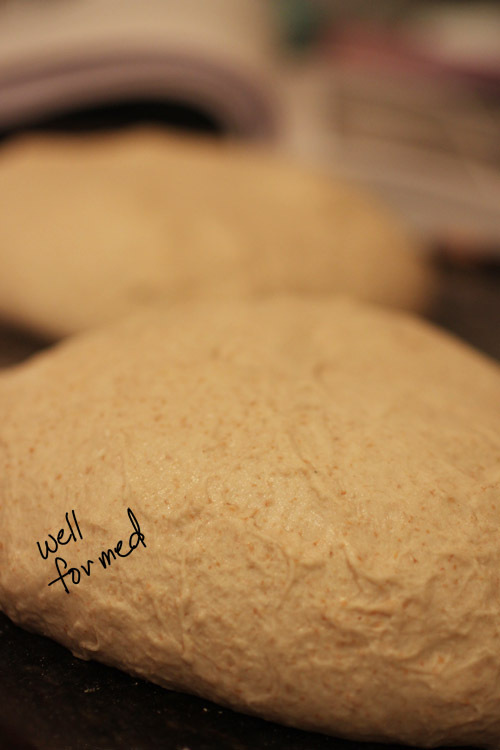 Once it’s divided, fold each dough portion onto itself to create a nice, round loafy-shape. Use as little flour (for dusting or non-stick purposes) as possible as you don’t want your bread to be dry. Let the dough rest for about 20 minutes. You can cover it was plastic wrap if your kitchen (or bathroom) is drafty. At this point, they are ready for the final rise. Prepare two large bowls lined with kitchen towels (not terry cloth). Dust the towels with rice flour. Tartine does not explain why they use rice flour for this purpose, and I certainly have no clue. But I bought some like a good instruction-follower and used it. This is the FINAL RISE. You can let these dough balls hang out at room temperature for about 3-4 hours OR you can put them somewhere cooler (like the refrigerator) for up to 12 hours. The choice is yours. I chose the fridge, as I had stuff to do. Before you start baking, place a dutch oven/cast iron pot in your oven and turn up the heat 500 degrees. Let it heat up for 20-30 minutes. Once the pot is nice and hot, remove it from the oven (OVEN MITTS!!) 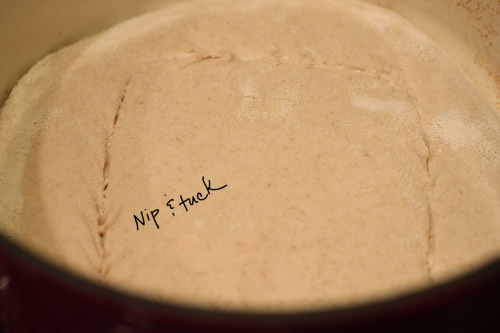 and plop your dough in there. You then need to score, or cut, the dough in a nice square pattern as seen above so that it can properly ventilate as it cooks. You are supposed to use a razor blade to accomplish this. but I didn’t have one so I used an Exacto Blade. Not very effective. Then, throw the lid back on and pop it back in the oven (reduce the heat to 450 degrees) and bake for 30 minutes. After 30 minutes has transpired, don your mitts again and remove the lid from the cast iron pot. Continue baking without the lid for another 20-30 minutes or until the crust gets a nice dark and golden brown. Remove your bread from the oven and also from the pot and let it cool…if you can. Jack up the heat of the oven to 500 degrees again and repeat the process for the second loaf. The good news is that it’s tasty and somewhat airy (check out those nice holes toward the top). The bad news is that it’s not very pretty and still a bit dense (no comments from the peanut gallery, please). 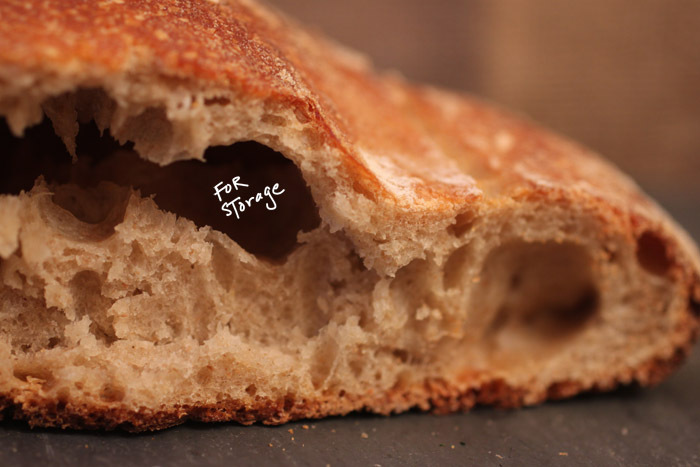 Your bread looks ideal for spelunking! Was a little afraid after reading the title of this post 🙂 I just love how you draw on your pictures. It really is innovative and makes reading your blog a lot of fun! 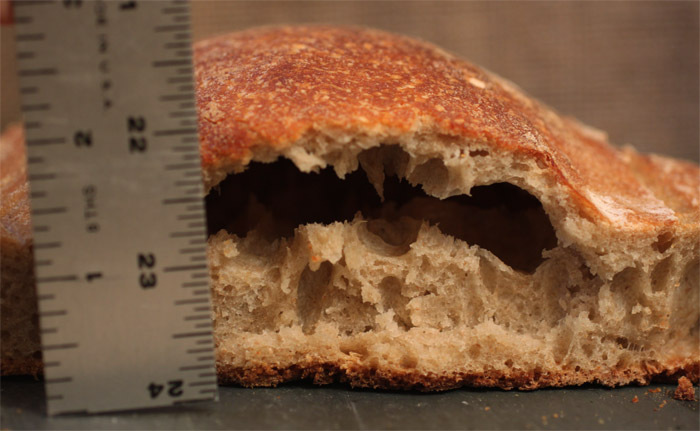 As for a less flat bread, theres always next time… Right? I try and strike fear into the hearts of my readers 😉 Glad you are enjoying the posts – that definitely makes me happy!